If you follow my instagram you know I got a HUGE package from Sephora. I am going to take some time and do a product review. 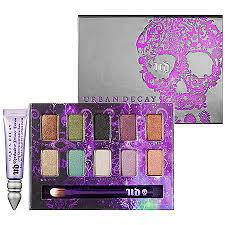 I have been wanting to get a new eye shadow pallet and came across Urban Decay’s Ammo Palette. I love the different colors so I went for it. Overall, I really LOVE this pallet! It came with “Eyeshadow Primer Potion”. I tried the eyeshadow with and without. Without the color still looks really bold and stays on HOWEVER, there is some glitter fall out when you don’t use the potion which makes for a little interesting look on your face. It isn’t crazy but enough to bother me. But as long as you use the potion it seems to eliminate that! BONUS**When you order from Sephora you receive a few free samples. One of the samples I chose was Boscia BB Cream. I have tried a few BB creams and most make me break out and don’t have good coverage. This Boscia BB Cream is a game changer…. it covers well enough for me to go and run errands and then for date nights I just throw on powder and my blush+eye makeup+ Lip and I am good to go! It feels light even with other makeup on top AND I have worn it three days and NO breakouts!